All transactions are safe and secure with a reliable history in online purchasing behind each of our associates. 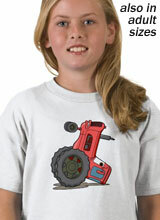 Buy the Mater Tractor Tipping t-shirt to own Cars clothing and merchandise. This humorous Tow Mater tractor tipping shirt reveals his idea of a good time. In the movie, Mater takes Lightning McQueen out into a field filled with sleeping tractors. He sneaks up to one of them and blows his horn. Startled, the tractor tips over and Mater busts out laughing. He urges McQueen to give it a try. "I don't even have a horn," Lightning replies skeptically. In an effort to scare the tractors, he decides to rev his engine. The noise is so loud that it scares all of the tractors and causes every one of them to tip over, leaving the two in hysterics. In addition to the Mater Tractor Tipping tee above, browse the Cars Clothing Gallery for more apparel like men's and women's clothes, kids shirts or hoodies.